(Please share!) 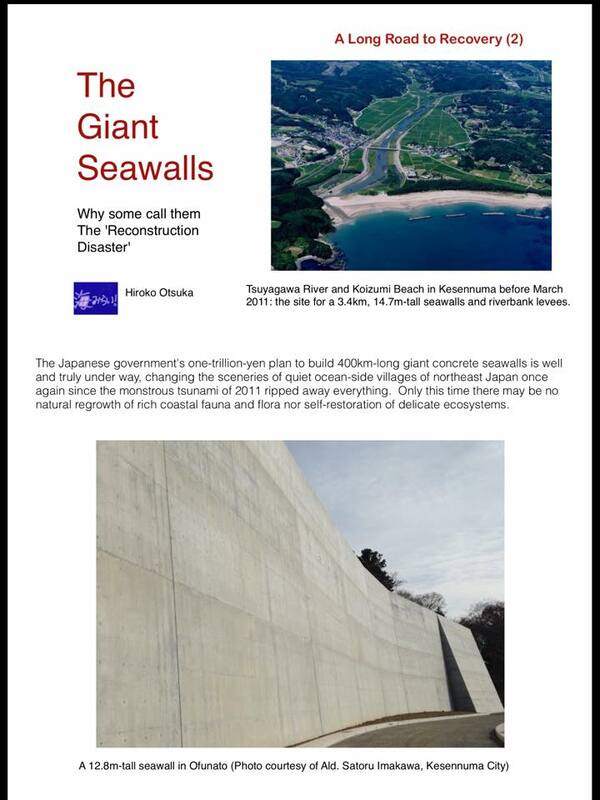 So this is the Japanese government’s controversial giant seawall plan: 400km-long, up to 50ft ( 15m) tall, as wide as 90m at foundation, concrete seawalls (dykes), which will be built on more than 400 beaches, lagoons and rocky coves of Tohoku Rias Coasts National Park. 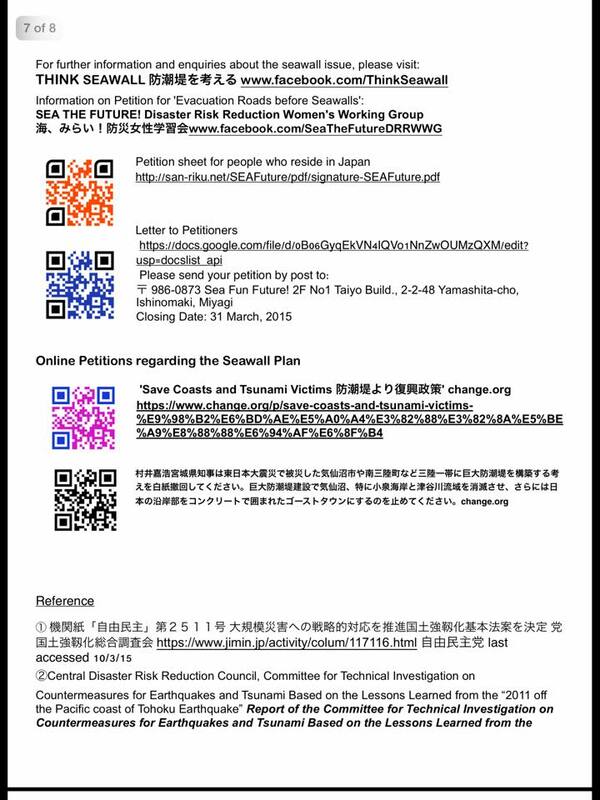 It is part of the 200 trillion-yen National Resilinece Policy to ‚protect lives and assets‘ from tsunamis of every 50-150 years. 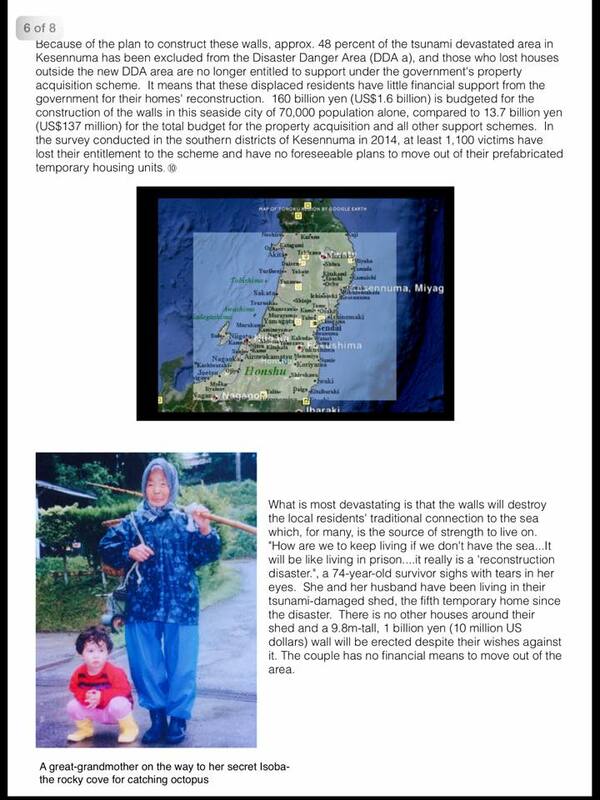 In kesennuma, nearly half of those locations have ZERO to a few residential houses in the area the walls supposedly protect. 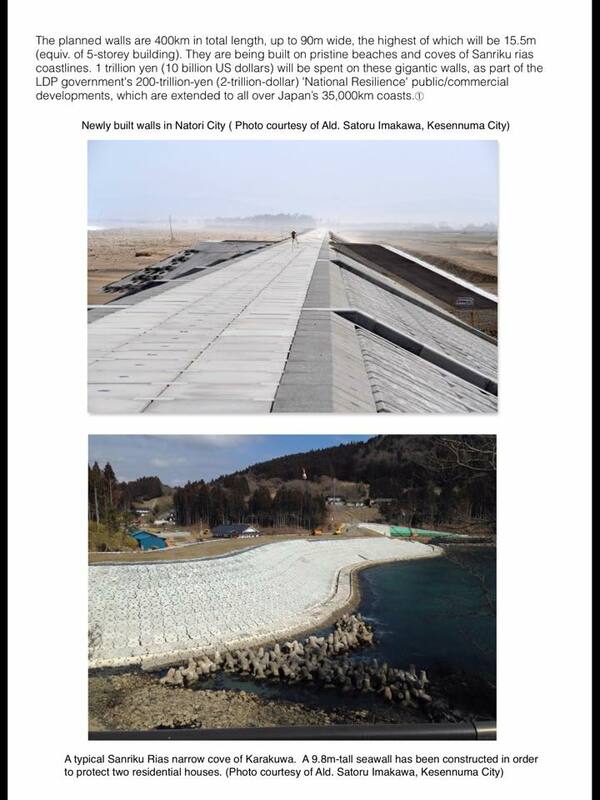 What would be its environmental effects? What would it do to the local traditional livelihoods of fishery and tourism? 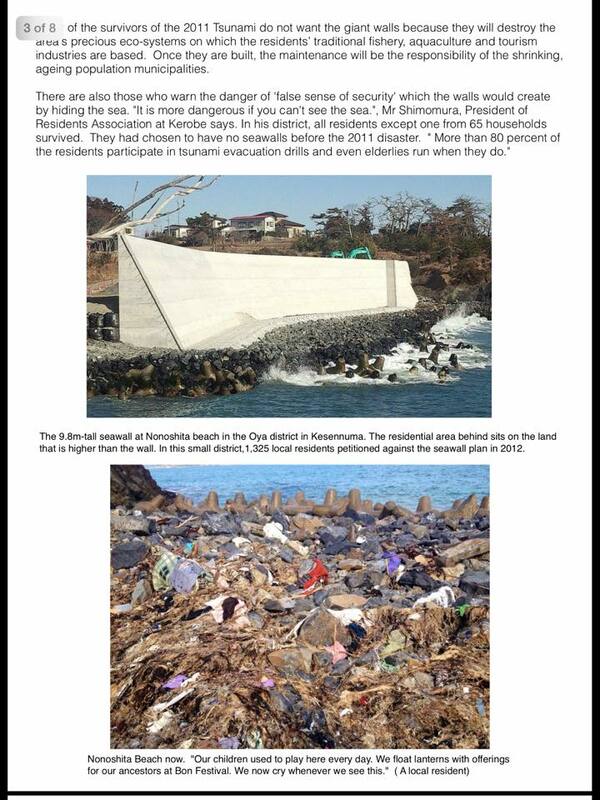 What happened to the lessons learnt from the 229-death toll among 3000 affected households of ‚Superwall‘ Taro city, compared to 65 deaths out of 3200 affected households of Kuwagasaki where there were no walls. 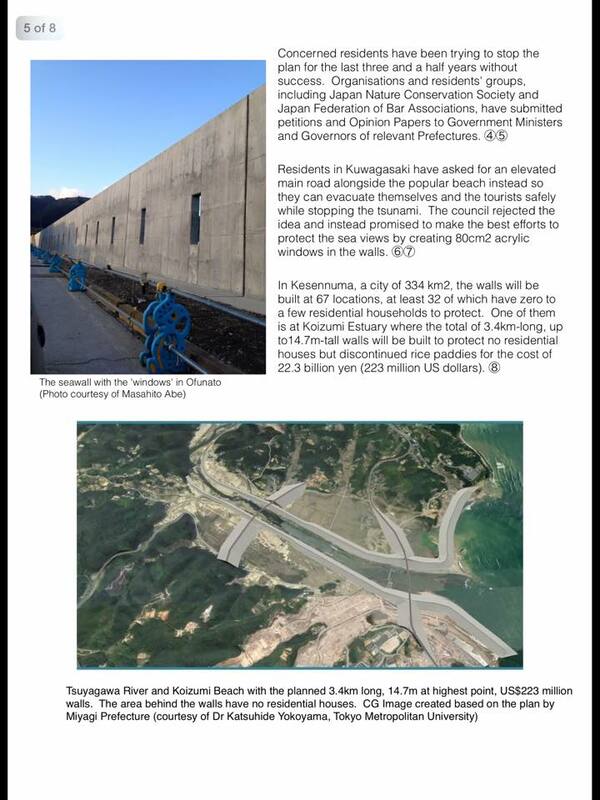 The planned walls are about half the size of the 2011 tsunami and if there is a tsunami that is ‚unexpectedly large“, the officials say ‚please run‘. How do the residents confidently judge whether or not/ when to run? 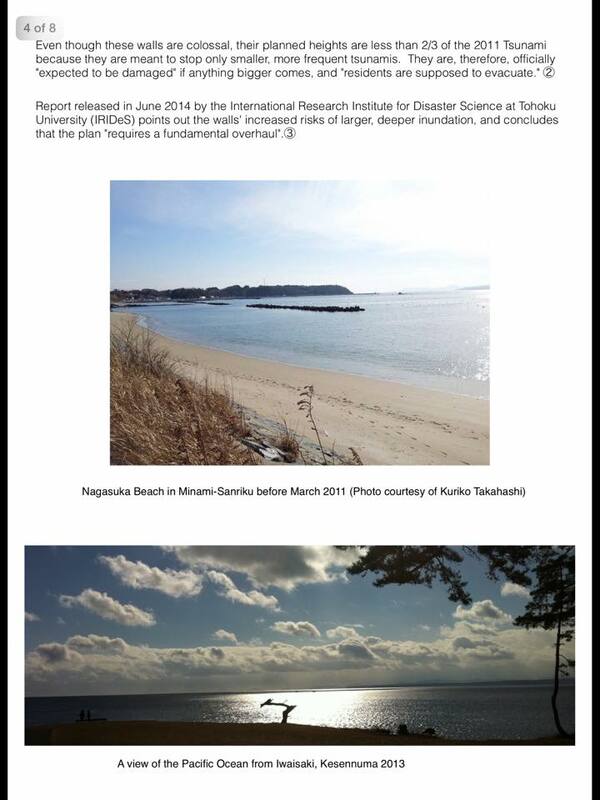 In Kesennuma, Approx. half of the displaced residents lost their entitlement to the government’s buy-out scheme because their properties are no longer designated as the Disaster Hazard Zone. In Tagajo, it is 100%! They would no longer be able relocate to higher ground, let alone moving out of their temporary units. Please help us stop this plan by spreading the petition below. Thank you for your help!